Good news from Tallahassee. This week the state legislature passed the lighthouse license plate bill. It just needs to be signed by Governor Crist and we will all be sporting this new plate on our vehicles. An outstanding job by the volunteers of the Florida Lighthouse Association, and remember, all of the money from its sale goes to lighthouse preservation here in the state. Oddly enough, an employee of ours came running in today and told me that there was a car in the parking lot with the Florida lighthouse plate on it. I said, "That's impossible. It hasen't been signed into being yet." But, sure enough, we went out to the parking lot and saw this plate on the back of a Volvo. It's my husband's volvo. We needed a plate for it and he asked for the Lighthouse plate, (not realizing it didn't pass yet) and they gave him the Vision plate, which is fine with me since my family has some vision imparied folks in it. 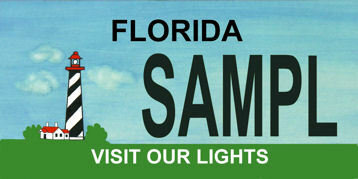 But, if anyone wants the FL Lighthouse plate that is coming out, you need to make sure to specify. I want to also clarify again that the money from this plate does not go to St. Augustine Lighthouse, but rather to the Florida Lighthouse Association, who hopefully can help support needy lighthouses. 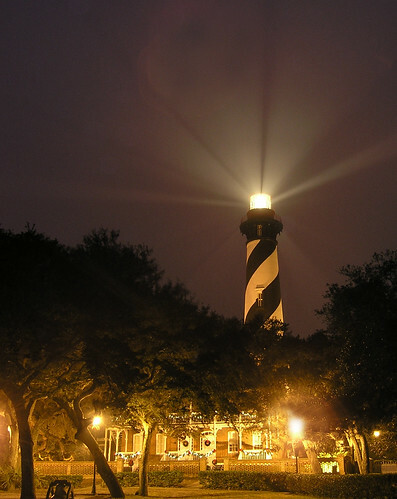 Beautiful night photo of the St. Augustine Lighthouse. Great article as for me. It would be great to read more about that topic.